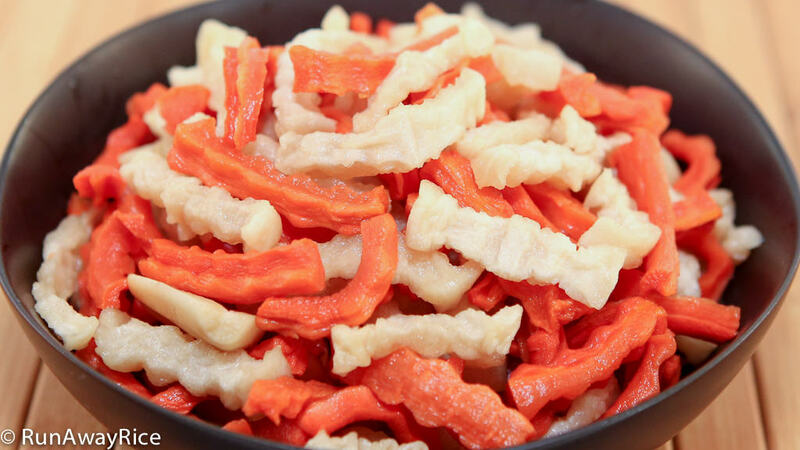 Although I could eat these Dried Carrot and Radish Pickles year-round, I only indulge in these savory, slightly sweet and crunchy pickles during Lunar New Year. That’s because they are always served along-side New Year’s Sticky Rice and Mung Bean Cakes (Banh Chung or Banh Tet). These pickles are salty good, thanks to the liberal use of fish sauce, but the texture is what I find most appealing. First the carrots and radish are dehydrated. Then they are pickled in mixture of fish sauce, water and sugar. The dry vegetables soak up the salty liquid and puff right back up. The results: a pungent pickle with an amazing crunch! I hope you’ll give this recipe a try. The old school way of making these pickles is to let them air dry in a sunny place for 2-3 days. This is how my Mom use to make them. If you wish to use Mother’s Nature golden rays to make your pickles, this method is just fine. After air drying for a few days, I recommend giving the veggies a quick rinse with warm water. Then use your salad spinner to get rid of the excess water before pickling. If you have a food dehydrator this works well too. It takes longer in a dehydrator, 4 hours on a Medium setting. 1 pound of fresh carrot or radish is approximately 1 cup dehydrated. Cut the carrot sections approximately the same length as the diameter of the radish. That way the veggies will be about the same size. Wash your jar thoroughly with soap and hot water. Any contamination will cause the pickles to wilt and even get moldy after a few days. When baking in the oven, make sure to rotate the baking trays so the vegetables dry out evenly. The pickles are meant to be consumed within the month. If you want to keep your pickles for up to a year, here’s what you do: Drain the pickling liquid into a saucepan. Heat the mixture over Medium heat and allow it to boil gently for 2-3 minutes. Remove from the heat and allow to cool completely. Pour the liquid back into jar. This extra step of boiling the pickling solution makes it last extra long. If you enjoyed this recipe, you may also like: Carrot and Radish Pickles (Do Chua), Pickled Mustard Greens (Dua Cai Chua) and Pickled Bean Sprouts (Dua Gia). Peel radish, carrots and garlic. Slice radish into circles approximately 1/4-inch thick. Use a wavy knife to cut into 1/4-inch thick stripes. Cut carrot into sections about the same length as the diameter of the radish. Cut each section into thinner slices, approximately 1/4-inch thick. Use wavy knife to cut into 1/4-inch thick stripes. Slice garlic cloves in half. Place radish and carrots in a large colander with a bowl underneath. Add salt and fill with cool water. Allow to soak for 10-15 minutes. Drain water. Toss vegetables in colander to shake off excess water. Spread vegetables including garlic on baking trays, placing close together in a single layer. Bake for 2 hours. Rotate the trays throughout the baking process so the vegetables dry out evenly. Once vegetables are done baking, remove from oven and allow to cool. In saucepan, combine sugar, water and fish sauce. Over Medium heat, stir until sugar is dissolved. When liquid starts to boil, turn off the heat and allow to cool. Wash a jar with soap and hot water and then shake off the excess water. Microwave jar on High for 1 minute to dry and sanitize further. 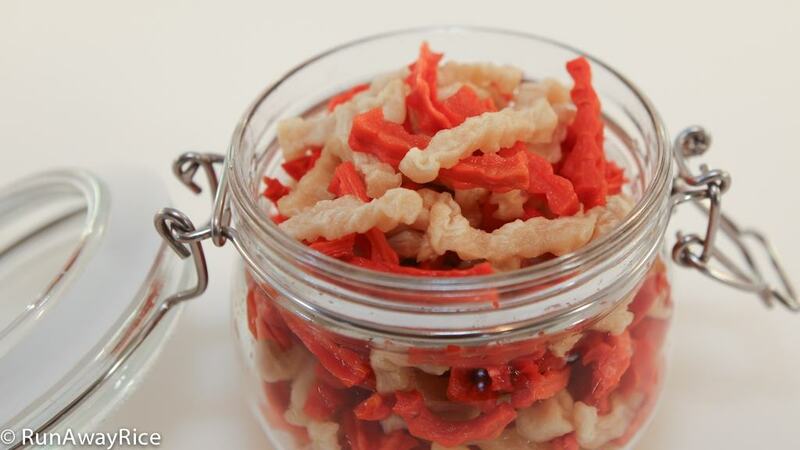 Fill jar with dried vegetables. Pour in pickling liquid. Use a spoon to immerse the vegetables into the liquid. Place lid securely on jar and allow to pickle for 3 days. Hello, just wondering if you could suggest a vegitarian substitute for the fish sauce? A good substitute is soy sauce/tamari or coconut aminos. Good Luck! Tried this recipy, the pickles turn out good after 3 days but the liquid is really thicker likely slime. what your suggestion to do if i want to get rid of the sticky slime and keep the pickles last longer. your reply is greatly appreciated, btw, love your web site. Hi, I am not sure why the liquid would be “slimey”. Were the vegetables dried sufficiently? Did you use a different type of radish other than Daikon? Was the jar clean and free of oils? If you think, it looks and tastes okay, it may just be residual vegetable juices combining with the pickling solution. Drain the liquid and cook over Low Heat for 10-15 minutes to reduce the water. Let cool and add back to the carrot and radish mixture. This should help to preserve the pickles longer. Good Luck! ps- my bánh chưng trial was successful, i m going to make more in few days closer to Lunar new year. Chi Trang. I’m running a little late on time before Lunar New Year. What can I do to make the wait time go faster? The normal process is about 2 weeks I think? Is it possible for me to cut down that to maybe 4-5 days? You still have time. Double the amount of fish sauce brining liquid and this will help the vegetables to soak up the liquid faster. If you make them today, they’ll be ready in 3 days. Good Luck! Thanks for the recipe Chi Trang. I eat them every time there are banh tet and banh chung. Yummy in my tummy! Glad you enjoy them John! I bought dried salted radish, soaked in water, added a bit of sour to reconstitute. After 24 hours, cut them into bite-sized strips. Very tasty as is. So I dried some carrots out in microwave, cut them into strips. Combined radish and carrot with Thai chili, fish sauce, etc. I always like to add a bit of vinegar, personal taste. I have to make a lot because it doesn’t last long long in my house! Is the oven heat of 250 in Celsius or Fahrenheit? Would the carrots and radish release a lot of liquid during roasting? Hi, The oven temperature is 250 degrees Fahrenheit. Yes, the carrots and radish lose a lot of their moisture during this roasting process. Gook Luck! Hi, I’ve got to try your steps as I really like this pickle. Just wondering though…2 lbs of carrot plus 2 lbs of radish…all immersed in only 2 cups of liquid (water / fish sauce) ?? Yes, the 4 pounds of vegetables are the starting weight. You’ll have some wastage for skin removal, trimming ends, and unuseable bits. The veggies shrivel quite a bit after they’re dried and you’ll have approximately 4 cups (roughly 1 cup per pound). Good Luck and feel free to share your results. Hi Trang! I could eat these as a main dish because they are so yummy! Good idea about the food dehydrator. Hi Winnie! These pickles are so savory good and I love them too. Thanks for stopping by.